Is Chex Mix tired? 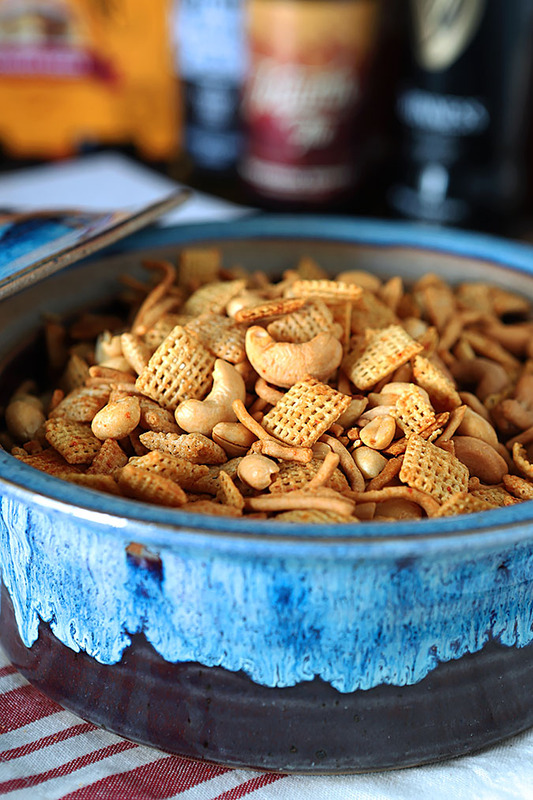 This Honey Sriracha Chex Mix with Peanuts and Cashews will spice things up a bit. Perfect for football games, family events and holidays. I remember my mom making Chex Mix for us as kids when we would be having my dad’s family over for a visit. There were a ton of kids between my dad and two of his siblings; they all had five kids each, so a quick and inexpensive snack was a requirement and this came to the rescue. We thought it a far cry from the usual potato chips so all of us devoured it. Now I’m not saying I wouldn’t still enjoy it but I think I’ve found something better; much more suited to my tastes today. And yes, I could still devour it! I noticed a display at the grocery store with both Rice and Corn Chex showing off a new recipe using Sriracha and Honey. Hello my favorite combination of ‘sweet heat.’ Plus I wrote glowingly about Rocky Mountain Sriracha recently and I’m always on the lookout for new ways to add it to my cooking repertoire. This was perfect. Alas…I don’t think the recipe was. While I loved that it was Gluten Free (no Wheat Chex!) so that I could serve it at a party and not worry about friends with gluten sensitivity, my first trial also thought it a bit bland. How could that be? So I checked out the recipe for the old fashioned mix and truth is, I thought it had a better ratio of ingredients; as in more butter and more spice. So I improvised. I combined elements of both. Not just more butter, Sriracha, and honey, this recipe also includes a bit of Worcestershire, garlic powder and salt. Oh yeah, that’s MUCH better. I also made more of it, like in double. Come on…we all know that if you only make one recipe worth that it will somehow disappear so I was just trying to circumvent the extra work; all in the name of making party people happy! 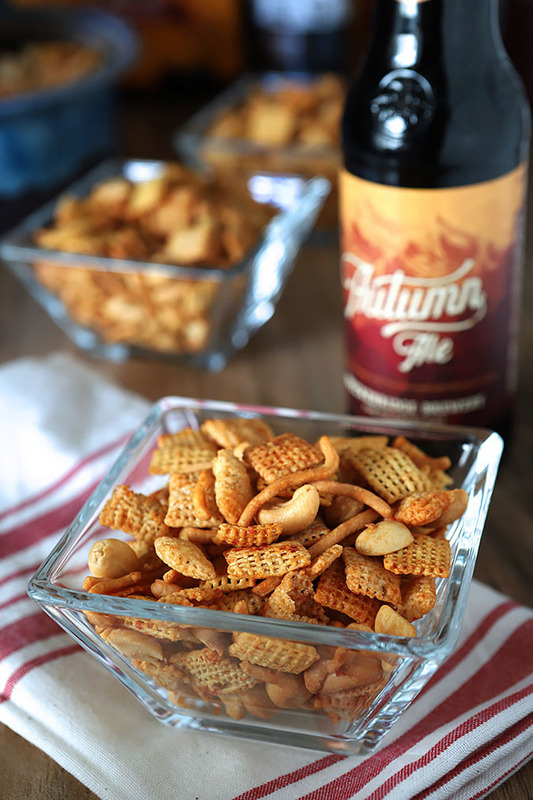 I am having a holiday party this weekend and this Honey Sriracha Chex Mix with Peanuts and Cashews will be served. If my neighbor Amy and I can keep our mitts out of it that is! She follows a GF diet so almost kissed me for eliminating the Wheat Chex (yes, Chow Mein noodles have wheat but are easy to spot and avoid for someone with non-celiac gluten intolerance; this would not work for a true celiac; you would have to omit those too). Next time my family gathers; they’re going to be met with this new version of an old standby. I know they will love it too! I know they’re not really the star of this snack, but if you love Chow Mein noodles like I do; you have to make some of these Peanut Butter and Butterscotch Haystacks…another childhood favorite that is easy and absolutely devourable! Combine cereals, nut and noodles in a large bowl. Melt the butter in a small pot and add the Sriracha, honey, Worcestershire sauce, salt, and garlic powder and stir to combine. Pour the mixture over the cereal and nuts mixture and coat thoroughly. Divide the mixture onto two large baking sheets with sides or a very large roasting pan and bake for one hour; stirring every 15 minutes. I thought I had a partial can of Wasabi Peas in the pantry; I LOVE those little hot bites and if I could have found them, they would have gone in too. Of course they're optional but if you want to boost the hit a bit, a cup of them would be another good option. Love this stuff. But it does require butter — ’cause everything tastes better with butter! Nice twist on an old classic — thanks. I thought the butter was a bit too light but I tried their recipe first. I was right. I mean, what’s the point if you can’t taste the seasonings? Might as well just throw them in a bowl right out of the box!